Calling all Yo! Sushi loving Armed Forces Members! YO! Sushi want to say thank you for your service by offering a 20% Armed Forces Discount off at these locations: Aberdeen Union Square, Bristol Cribbs Causeway, Cambridge, Cheltenham, Gatehead MetroCentre, Nottingham, Plymouth, Waterloo Station, Whiteley Shopping and York. Get 20% off your total bill all year round, Tue- Fri and on Sundays when you present your Service, Military or Armed Forces ID. When you are in a YO! Sushi restaurant, just present your Armed Forces or Military identification card to get your 20% discount off your total bill! It´s worth checking with the YO! 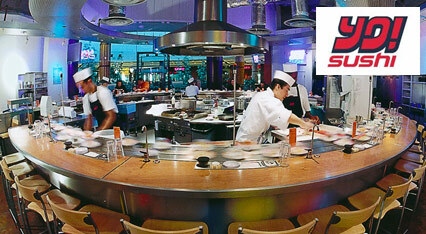 Sushi staff to see if they support the Armed Forces Discount before ordering as a few restaurants may not. 2. 20% off your total bill only valid when you show a valid Service, Armed Forces or Military Identification card. 3. Offer is valid from Tuesdays - Fridays & Sundays. 4. Offer is not valid on Take Away. 5. Only the card Holder ccan claim this discount. 6. Offer not transferable or available in conjunction with another offer (e.g. our Blue Mondays, Super Sumo Sundays or YO! Picnic offer) and there is no cash alternative. 7. YO! Sushi Manager´s decision is final.